I was provided with a Personal Cup Adaptor by Vitamix for review and recipe development purposes. All thoughts and opinions expressed are my own. Berry Beet Juice is an accurate name for today’s recipe but in our house, we just refer to it as the “best red juice” ever. I am a huge fan of beets as many of you know and love that I can blend them raw in my Vitamix. When you have picky eaters in the family, the blender can help you sneak more nutrition and variation into the diet. While it has always been easy to make juice at home in your blender it is now even easier with the Personal Cup Adaptor. Making personalized recipes to meet the individual preferences of any family member is downright simple. In the past, I would have made a big batch of juice and everyone better like it the way I like. Now, it is so easy to substitute a little apple juice for the water in my daughter’s blend to make it more enjoyable while still fooling her into drinking fruits and veggies. Win/Win. I’ve always wanted the benefits of the personal cup size with the power of my Vitamix Pro and this nifty adaptor didn’t let me down. There are so many benefits of Whole Food Juicing and one of the main ones often cited is that you retain the fiber of the fruit and veggies. While this is important, I really appreciate how little prep and cleanup there is when I use my blender to make juice. If I had to take apart a juicer and clean it I would never, ever make it. Let’s be honest. 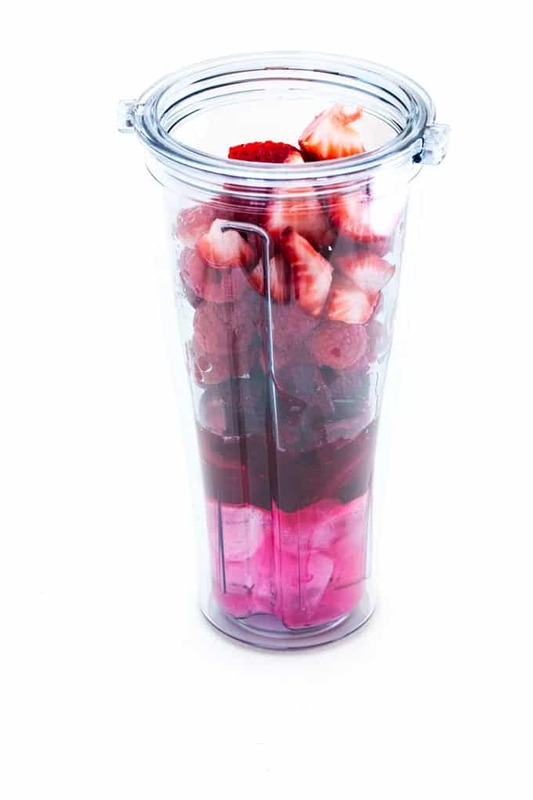 The 20-ounce blending cup is the perfect size for both blending and enjoying your juice. To ensure a great blend, make sure to reverse the order you normally put things into your blender jar. Normally, I put ice in last but since we are inverting this blender cup you need to put ice in first, followed by the beets and berries and liquid. Once you get this down you will not be disappointed in how easily this blends. If you are making big batches in your normal blender don’t be afraid to use your tamper. The tamper is your friend! The first time I made juice using the personal cup adaptor I was afraid that it wouldn’t blend properly because there was no tamper but the only thing missing was the Vitamix vortex. What is your favourite juice blend? I would love to hear from you. I’m always looking for new flavour combinations to add to my list of favourites. If you haven’t already, you should also give this Cucumber Grapefruit Juice a try! 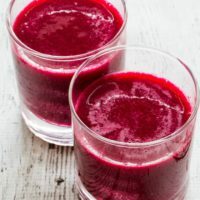 Berry Beet Juice, known simple as the best red juice in our house, can be made in just minutes. No added sugar! Add all ingredients to your blender jar. If you are using a personal sized blender jar that is inverted on the base add ingredients in the order listed above. Otherwise, reverse the order. Turn blender on low variable speed and slowly increase to variable speed 10. Blend for ~45 seconds and serve. Please note, that the nutritional details are an estimate only and may differ depending on the source of your ingredients. Can’t blame her 🙂 I do the same! That cup adaptor sounds so useful! This is a lovely recipe and I adore beets and berries together. Thanks Kate. 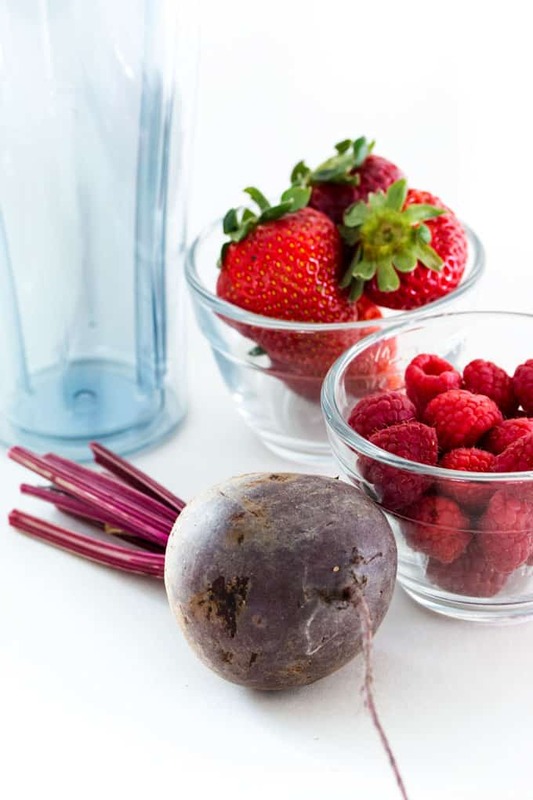 Beets and berries are a perfect combo! Just brilliant! 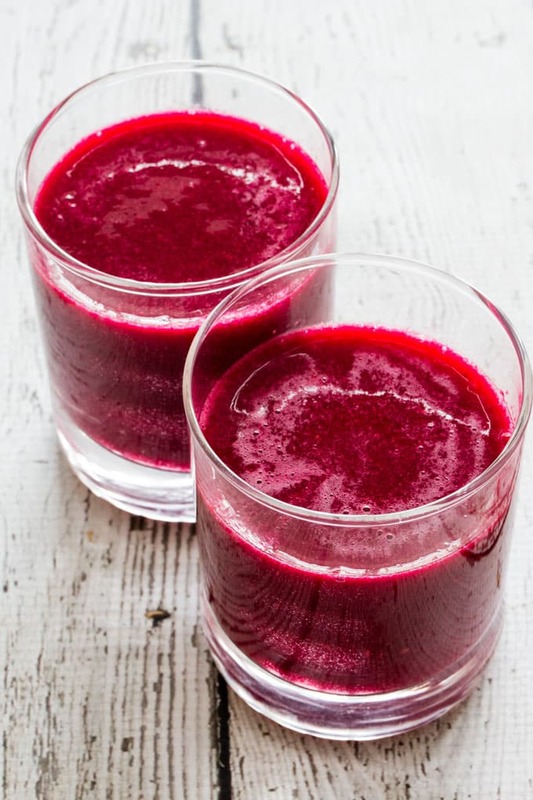 Beetroot is one of my favourite juice ingredients and it’s SO good for you too! Thanks Jane! Beets are one of those things I wish I’d discovered much earlier in life. This is the first recipe ever – literally EVER – that has made me reconsider my aversion to beets. 🙂 I’m also in the market for a new blender/juicer/smoothie-maker, so am totally intrigued by the adapter! Sign me up to get regular updates from Blender Happy!